Doesn't mean you'll enjoy it. Last night we started our scuba training. Last night was review of what we learned during our self-study prior to the class. I was super excited about all the possibilities that scuba could bring. The fantastic sights to see - the fish, the coral. This morning we were in the pool. I'm not very comfortable under the water, and I've never been able to do anything under water without physically plugging my nose. 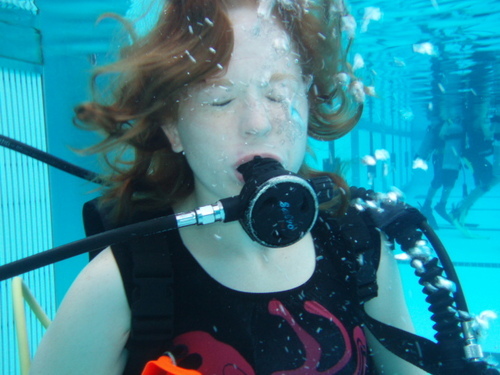 The first exercise we had to do under the water was breathe through the regulator without wearing a mask. For a full minute. It put me into total panic mode. I was able to finish most of the other requirements during today's pool session, but I did have to skip one entirely. No mask-buddy drag. It was all just a bit too much. I've been on an emotional roller coaster ever since. I can't even count how many times I've fought back tears. ok actually cried. Jeff and I have spent hours discussing this. What could have been different. How my reaction was normal/justified. Now, I'm totally torn. Do I continue working toward my certification or do I quit? Most of what we're learning are emergency procedures that most likely I'll never need to do. Most likely, once in open water it will be a much easier, more enjoyable experience. I've pushed myself immensely in the past year at riding a bike, so I'm *nearly* convinced I can push myself at this, too. Such a brave post! It's the truth that there are often bumps on the road to achieving our dreams. Don't give up - you can overcome it, with time and practice. Just be patient with yourself! I can relate to the anxiety you feel regarding water - putting my face in the water was a huge obstacle to me learning to swim last fall. I still don't like it, but I can do it. I know you'll find the same is true for you...you may not like it, but you can do it. @Laura, Thanks for such a supportive comment! With my emotional state last night (when I read it on my phone), it brought tears to my eyes. Again. :-) You're right. It will just take time, practice, and a whole lot of patience! I agree - be patient with yourself. It's okay to go slow. TNM, I agree, too. And the 2nd pool session was much better - comfort-wise. Yay!